Male giraffes are the world’s tallest animals, attaining nearly 6m (20ft) in height and weighing up to 1900kg (4200lb). Their height enables them to reach juicy acacia and myrrh leaves that are too high for other browsing wildlife such as antelope and elephants. They also have a modified upper neck joint, allowing them to stretch their head upwards, and a tough 45cm (17.6in) tongue for tackling the thorniest of high branches. 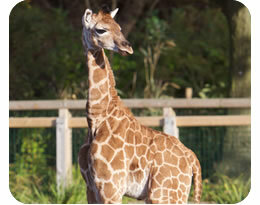 When stretching down to eat and drink, giraffes have a special valve that prevents their blood rushing to their brain. Giraffes spend much of their day feeding so nature has provided them with dark blue tongues to prevent them from getting sunburned!